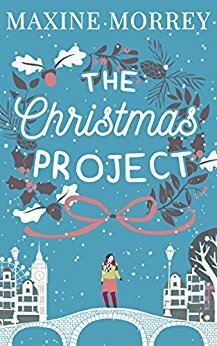 Book Review: The Christmas Project by Maxine Morrey. I did not want to put this book down!!! Seriously the amount of late nights I got reading this book, phew my eyes were stinging trying to get through the days. But it's all OK, because no matter how much my eyes were stinging and I was stifling yawns, I was smiling so big. I loved this book. I just loved it. Maxine did an absolutely magical job of creating warm, inviting characters that I simply fell in love with right away. Laugh, I did. Giggle, I did that too. Swoon, most definitely. Tear up, yes I couldn't help it. Disappear into happy, little book land that you can't wait to escape to every day...yes, yes and yes! In 'The Christmas Project' we meet Kate Stone, a professional organizer who has been given the task of helping her best friends brother get his life together. Kate wouldn't normally do this kind of favour, as it's important for her clients to actually want to de-clutter their lives, she's not there to make them, but due to her very best friend being adamant, she just can't say no. Furthermore, Kate wouldn't normally call a client an arse on the first day either, but due to him being an honest to goodness arse and her seemingly unable to lie to said client, it may have slipped out. In all her years of professional organizing it seems this client might just be her toughest yet. Since his wife left him, Michael O'Farrell has let his house turn into quite the state, but that doesn't mean he needs some sort of professional cleaner to look after him, and since when was organizing other people's homes an actual job? No matter how gorgeous the so called professional organizer may be, he most certainly will not be needing her assistance. I just smiled huge writing those brief descriptions of Kate and Michael. Honestly, I just adored both of them. Kate was funny, fiercely independent and awesome, with such a sweet, caring nature and she loved to help people. I loved how happy she got when she made a difference in someone's life. Her passion for her job was contagious, not to mention that I found her job to be really interesting, I very much wanted to be part of her little team. Michael was wonderfully charming and had me giggling into my coffee. His interactions with Kate often had me laughing out loud, you know in between the swooning. :p Furthermore, his interactions with his sister and her family were utterly heartwarming and showed his soft side beautifully, I definitely got the warm fuzzies in my belly reading these bits. As for his sister, and Kate's best friend, Janey, she was brilliant. Her no nonsense attitude, loyalty to Kate and Michael, loving, yet humorous day to day interactions with her kids and family were precious and will have you thinking 'goals'. I loved when the whole family got together. I'm telling you, you will be sucked in from the very first page of 'The Christmas Project'. I guarantee you will become addicted to Kate and Michael's banter and the roller coaster ride that is their story. I couldn't turn the pages fast enough, wanting to know if Michael's house would be done in time, wanting to un-lock every door and see what lurked behind it, wanting to uncover the mysteries of Kate's boyfriend and where he was, and of course, needing to see if Kate and Michael would become more than 'kind of friends'.